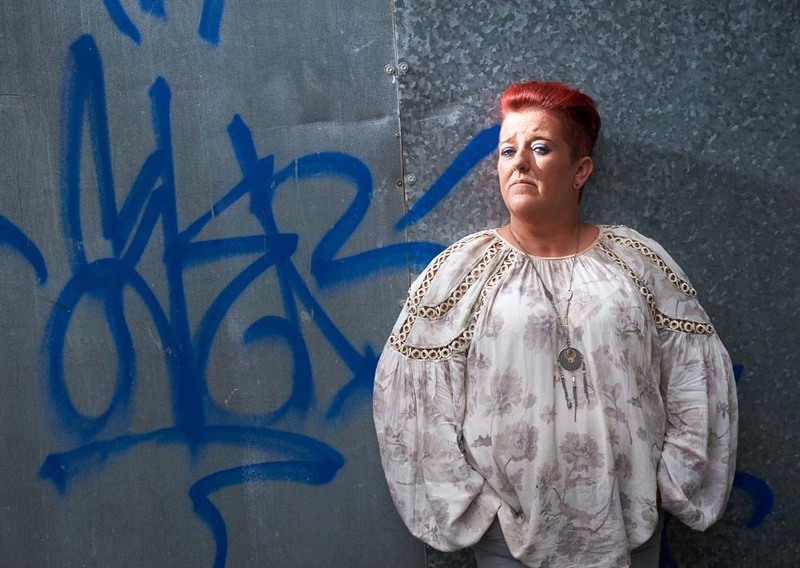 Ennis woman Maria Ryan of Sinn Fein, who has a family member that was affected by drug abuse. Photograph by John Kelly. MARIA Ryan grew up in a very happy home in Ennis, with two wonderful parents and three brothers. They were surrounded by extremely good neighbours and friends, and life was good. However, when a family member started having difficulties they were thrown a curveball. Maria’s Irish twin, whose name it still pains her to say, began smoking weed as a teenager. At first, this was fine, she said, but he began to do more and more and he started to change slowly. When Maria’s brother smoked cannabis, something in it reacted badly with him and he began to hallucinate very badly. “He was seeing all sorts of terrible things that were coming after him, each time he took cannabis, the worse these psychotic breaks became. He would try to climb the wall at night, screaming like a banshee at the top of his lungs,” she said. Maria remembers vividly the screams, describing them as “feral” and “high-pitched”. He continued to use the drug, but it led him to begin self-harming, resulting in deep scars visible on his arms and neck. “It was so heartbreaking to see,” Maria said, and so she could not stand back and do nothing. “We were Irish twins and had a very close bond, there was never one without the other, our names slipped together off people’s tongues. I knew I would have to fight to protect him, not only from himself but from drug dealers too, and anybody that would hit him or pick on him because he would say things and do things on drugs and alcohol that he would never have done sober,” she said. Maria and her brother started attending the local youth centre and it was here that she noticed his psychotic breaks became more and more apparent, as be began to develop an obsession with religion. “At the time that was extremely hard for me to deal with at such a young age, but my love and bond with him only grew even stronger as I lost a little more of him to drugs,” she said. A diagnosis of bipolar disorder and a now habitual drug dependency let Maria’s brother to frequent St Brendan’s unit and the day hospital, and he was placed on Lithium. “He by now had tried to commit suicide a few times. We as a family never ever gave up hope that one day he would find peace. One of his doctors convinced us that by placing him in Our Lady’s for a few weeks it might scare him into stopping taking drugs, but after going in there he was never the same again,” she said. She described walking into the facility and being greeted by “a piss-infested derelict hallway” and recalled knocking on a “big prison-like door”, and seeing him “so scared he could barely talk”. Even though Maria said they tried to get him out, he was admitted for three weeks, after which he attended a rehabilitation centre in Dublin, which cost £12,000. Maria remembered being in the back of the car with him that day, holding his hand, hoping and praying that this was what he needed to kick the habit. “He was taken off his lithium because it is a rehabilitation centre and as a result he lost touch with reality not long after the first week. He started building altars everywhere, so after two weeks he came home,” she said. There was one person who took a particular interest in Maria’s brother during this turbulent time and that was his psychiatric nurse and dear friend, PJ Dickson. “He, with us, did everything he could to protect himself, but the dealers would be standing at the gates of the day hospital pushing drugs on him, which he could not say No to,” she recalled. He was accommodated by the HSE in the community for a number of years and was sharing a house with an older patient of the day hospital but when that man died, another person began staying in the house and this is when he got his introduction to cocaine. “It wasn’t long before he started taking cocaine off this guy and his friends. We had to follow him around because he was completely unhinged from the drugs and his meds. For eight weeks we begged and pleaded with the Acute Unit to admit him. The law had changed so we couldn’t section him. The guards wouldn’t even arrest him,” she said. She recalled people trying to intimidate her by telling her to back off, that they were looking after him now and having to stand up to this. She was often left trembling after encounters like this, but said, “I would have done anything to protect him”. Maria’s brother was in crisis and she believes out of desperation he hurt a waitress in a local hotel and was arrested. “He spent seven months on remand in Limerick, sharing his cell 23 hours a day with a murderer. He was so scared when we would visit him, even though he never admitted it,” she said. While in prison, Dr Ananth Pullela, a forensic psychiatrist, diagnosed Maria’s brother with paranoid schizophrenia and made adjustments to his medication. He was released from prison, having been sentenced to 14 months under the care of the Ennis Acute Unit and five years’ probation. “He was clean and sober for the remainder of his life. The witty sense of humour and his beautiful smile were back. He was very happy the last 10 years of his life, living in assisted living, with amazing psychiatric nurses and other young men dealing with their own lives, and the tea ladies who mothered them all with love. We have wonderful memories with him, despite the hard times. He passed away in his sleep on Friday, 8 April, 2016, at the young age of 41”. She said the biggest fight of her life has been trying to cope with him not being there. “He is the reason I initiated a campaign to close the three head shops in 2009, and we got them shut down by 2010,” she said. Maria has now started a campaign to address mental health services in the county. She has invited consultants in psychiatry/psychiatric nurses/clients/doctors/chemists/secondary school principals and addiction counsellors to attend a public meeting on July 26, at Treacy’s West County, at 7pm.